Register for the Hudepohl 14K/7K Brewery Run on September 16. It’s the race that thinks it’s a party! The Hudepohl 14K/7K Brewery Run on Saturday, Sept. 16 wraps up the Christian Moerlein Beer Series and at the same time kicks off Oktoberfest Zinzinnati, the largest Oktoberfest celebration outside of Munich. 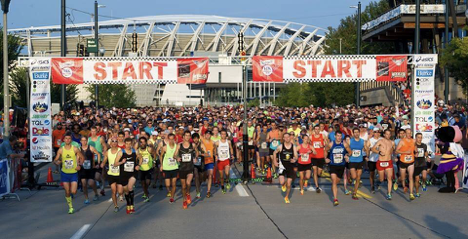 The Hudepohl 14K (named after the iconic Cincinnati-brewed beer) and shorter 7K start and end along Cincinnati’s riverfront. Along the course, you’ll pass by many of the historic brewery sites of early Cincinnati and follow the routes that the horse-drawn carts took to bring the beer from the breweries to the riverboats that would take the beer throughout the country. And once you’re finished, the party continues at Oktoberfest with brews and snacks as those who have completed the Christian Moerlein Beer Series can celebrate their Brew Hog-dom!